Nigeria Gists: #MustRead: What Can Buhari Do About Amaechi? 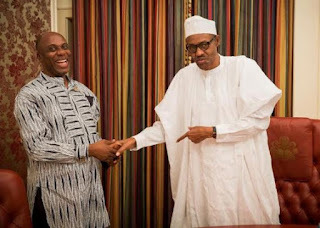 #MustRead: What Can Buhari Do About Amaechi? That piece by the conservative press was a well-timed slung shot, calculated to land in Nigeria at the time when President Muhammadu Buhari’s band of disciples were still celebrating his almost unexpected riposte to the British PM, David Cameron; his earlier diplomatic gaffe at the anti-corruption summit in London had shown the level of contempt and condescension Cameron had for Nigeria. The report had nothing new to say — for Nigerians, that is — and it cannot be described as a particularly intelligent piece of journalism. It was largely a pastiche of recycled speculations about the role Amaechi paid in the 2015 election of Buhari. By now, everyone in Nigeria has either heard of or read about how Amaechi was said to have “bankrupted” Rivers State while he was governor so as to finance Buhari’s election and for that reason, the President remains indebted to him, politically and morally. The paper did not present proof of this accusation and it is rather doubtful it had any. We know that money spent on election in this part of the world is neither invoiced nor receipted and anyone asking for empirical evidence in this case is either extremely naïve or simply duplicitous. Whatever the point or the politics of the piece by Daily Mail, what cannot be dismissed is its likely potency. Nigerian leaders tend to recoil at bad press when it comes internationally than when handed out by local critics. Nothing nurses the Nigerian leader’s narcissism better than to be given that much coveted back pat from the West. That perhaps explains why Buhari speaks more to the foreign media than he engages local journalists. At some point, whether by local or foreign journalists, he will be asked how he manages to balance his anti-corruption agenda with the company he keeps. These efforts to stem corruption should all have been commendable except they tilt in only one direction — towards the main opposition party members. In the long run, it may just turn out to be another Obasanjo-esque method of fighting corruption: crushing potential dissidence rather than reaching for the more challenging task of evolving scientific methods of quenching abuse of public trust. How can the EFCC sincerely confront the PDP about campaign funds and not once turn the light on the All Progressives Congress and ask the same question? How could the APC have funded its elections if the party did not coopt public funds? Do they mean to tell us that the huge sums of money the party spent during the elections came from the torokobo donated to them by a few members of the public? Should not the EFCC be genuinely interested in finding out if indeed Amaechi played the role that has been ascribed to him? For a party that promised to fight corruption, promote transparency and be accountable to the public in a way their opponents never were, should the house-cleaning not have started from their own backyard? The question of campaign spending is such a critical one that should not be left to the vagaries of politics; a sincere leader who wants to reform the polity will at some point have to confront it and its implications on the government. Those who fund campaigns are not doing it out of sheer altruism, they are paying forward and the payday must come. When that time comes, they will not simply roll over and play dead. They will expect that certain policies be tailored to favour them. This coterie of big spenders will get a lot of benefits higher and above the ordinary citizens around whom the entire concept of democracy is supposedly centred.